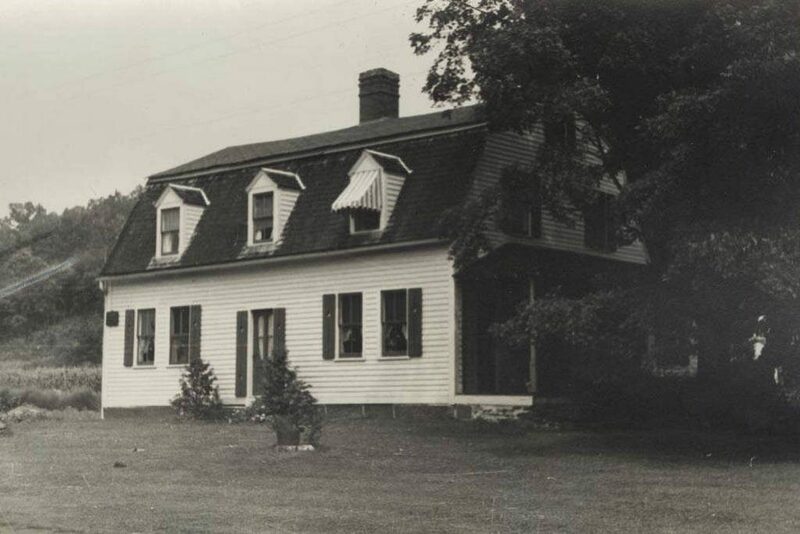 The house at 731 Hopmeadow Street in Simsbury, around 1935-1942. Image courtesy of the Connecticut State Library. This house was built in 1822 as the home of Elisha Phelps, who belonged to one of the leading families of Simsbury. His father, Noah Phelps, was a lawyer and judge who served as an officer during the American Revolution, and later served as major general in the state militia. Likewise, Elisha became a lawyer, graduating from Yale and from Litchfield Law School before being admitted to the bar in 1803. He married his wife, Lucy Smith, in 1810, and they had five children, although their first two died in infancy. Aside from his law practice, Elisha Phelps had an extensive political career. He served in the state House of Representatives in 1807, 1812, 1814-1818, before being elected to Congress as one of Connecticut’s at-large representatives in the U.S. House of Representatives. He served one term, from 1819 to 1821, before returning to the state legislature, where he served as Speaker of the House in 1821, and as a state senator from 1822 to 1824. He was subsequently re-elected to two terms in Congress, from 1825 to 1829, and then served for another year as the state’s Speaker of the House in 1829, before becoming the state comptroller from 1831 to 1837. When Elisha and Lucy Phelps moved into this house in 1822, they had three surviving children. The oldest, John, was about eight years old at the time, and their daughters Lucy and Mary were about four and three, respectively. The three of them would spend the rest of their childhood here, and John would go on to attend Trinity College in Hartford, graduating in 1832. Like his father and grandfather, John became a lawyer, and in 1837 he moved to Springfield, Missouri, where he would become a prominent politician. He served in the U.S. House of Representatives from 1845 to 1863, and as a colonel in the Union army during the Civil War. He was appointed by Abraham Lincoln as military governor of Arkansas in 1862, although the Senate never confirmed his appointment. However, he later went on to become governor of Missouri, serving from 1877 to 1881. In the meantime, Elisha Phelps lived here in this house until his death in 1847, and his son-in-law, Amos Eno, inherited the property. Eno was also a Simsbury native, and had married Elisha’s daughter Lucy in 1836. However, the couple moved to New York City, where Eno established himself as a merchant and real estate developer. He invested heavily in Manhattan real estate, including building the Fifth Avenue Hotel at Madison Square in 1859. At the time, Madison Square was considered too far uptown for a fashionable hotel, but the location proved to be ideal as the city grew. He also owned land at Longacre Square, which was later renamed Times Square, and he owned a number of undeveloped lots on the Upper West Side. By the time he died in 1898, Eno’s various real estate investments were valued at over $20 million, or around $600 million in 2018 dollars. Amos Eno’s primary residence was in New York City, but he maintained this house as his summer home, far removed from the heat, crowds, and smells of the city. During one such summer, in 1865, his grandson, Gifford Pinchot, was born here in this house. The son of James W. Pinchot and Amos’s daughter Mary, Gifford would go on to become perhaps the most notable of the many prominent descendants of Elisha Phelps. Like many of his ancestors, Gifford Pinchot attended Yale, graduating in 1889. He became a forester and conservationist, and in 1897 joined Theodore Roosevelt’s conservation-oriented Boone and Crockett Club. In 1898, Pinchot was appointed as the nation’s Chief of the Division of Forestry, serving under presidents William McKinley and Theodore Roosevelt. In 1905, the Division of Forestry was reorganized as the United States Forest Service, and he became the agency’s first chief. He would remain in this position until 1910, when William Howard Taft, Roosevelt’s hand-picked successor in the White House, dismissed him following a dispute between Pinchot and the Secretary of the Interior. Roosevelt took this dismissal personally, as Pinchot was a close friend, and the controversy helped lead to the 1912 split in the Republican Party, between Roosevelt’s progressive wing and Taft’s more conservative wing. Pinchot would become a major figure in the progressive movement of the 1910s, and served as president of the National Conservation Commission from 1910 to 1925. He was also touted as a possible Progressive Party candidate for president in 1916, although Pinchot declined interest and the party ultimately endorsed Republican candidate Charles Evans Hughes. However, Pinchot’s political career continued in his home state of Pennsylvania, where he served as governor from 1923 to 1927, and 1931 to 1935. During Pinchot’s rise to national prominence, his birthplace here in Simsbury remained in his extended family. He spent many summers at the house during his childhood, and in later years would often visit his grandparents here. Amos Eno died in 1898, only a few months before Pinchot’s appointment to head the Division of Forestry, and his summer home in Simsbury was inherited by his daughter, Antoinette Wood. She made substantial alterations to the house, including having the original gabled roof replaced with a large gambrel roof, and adding a large wing to the rear of the house. She also hired prominent landscape architect Frederick Law Olmsted, the designer of New York’s Central Park, to create new landscaping plans for the property. Antoinette Wood owned the house until her death in 1930, only a few years before the first photo was taken. 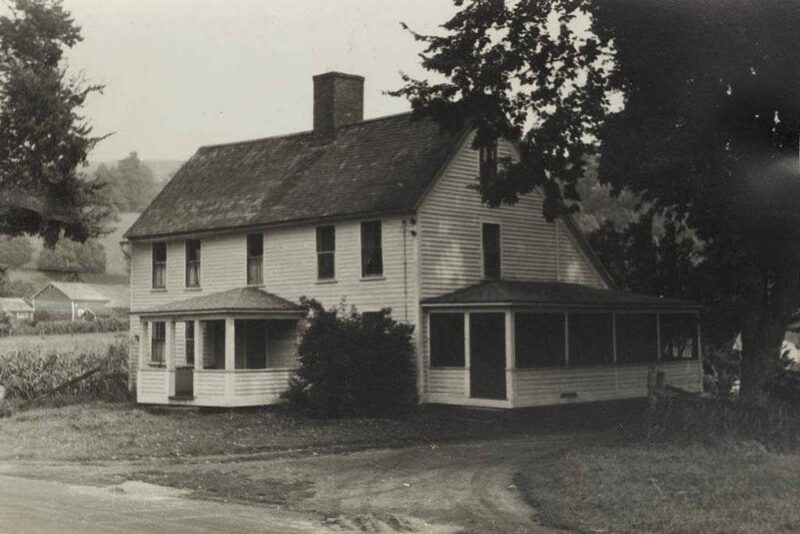 It would remain in the Eno family until 1948, when it was sold and became a restaurant, known as The Simsbury House. Then, in 1960, it was purchased by the town of Simsbury, and underwent extensive renovations in 1985. 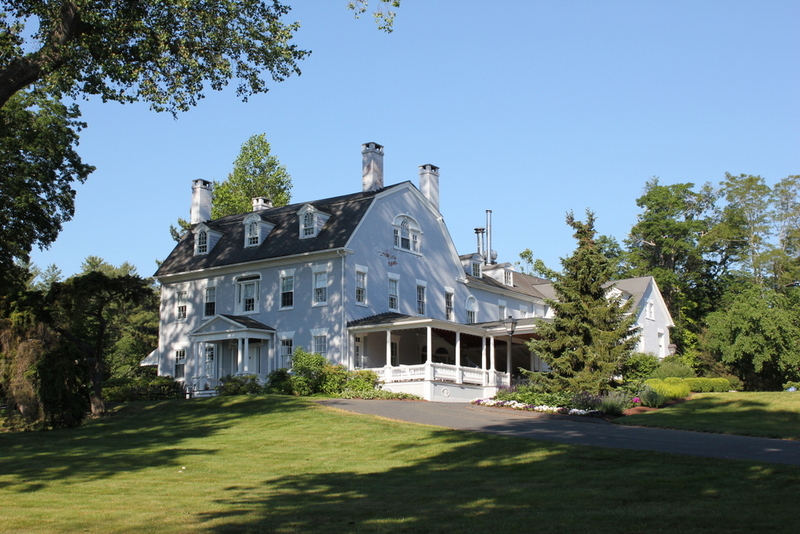 The house is now the Simsbury 1820 House bed and breakfast, and it is on the National Register of Historic Places, as both an individual listing and as a contributing property in the Simsbury Center Historic District. 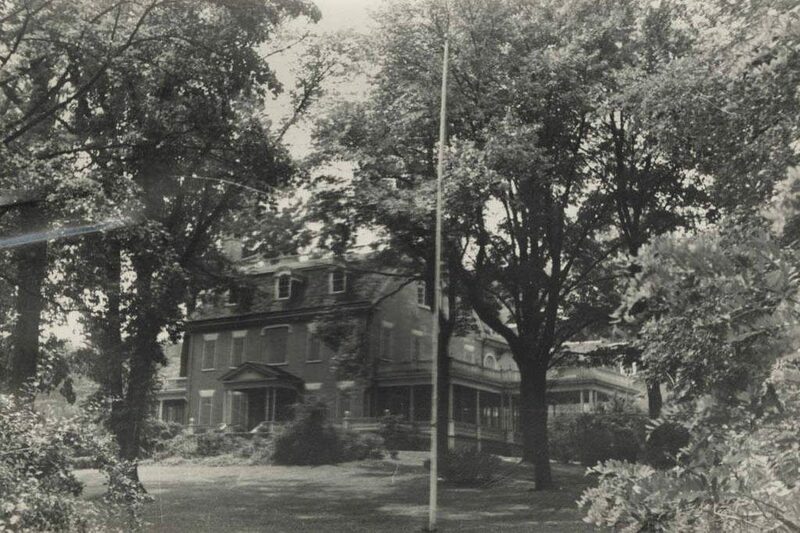 The house at 42 East Weatogue Street in Simsbury, around 1935-1942. Image courtesy of the Connecticut State Library. This house is located in the Simsbury village of East Weatogue, a small farming community on the eastern edge of the town, situated right at the base of the Metacomet Ridge. Compared to some of the other colonial houses in the village, this house was fairly modest, and was built around 1775 for Amaziah Humphrey, who was only about 21 years old at the time. A year earlier, he had married his wife, Elizabeth Harris, and they moved into this house following its completion. However, only a year later Amaziah enlisted in the Continental Army, serving as a private in New York during the American Revolution. Amaziah and Elizabeth had at least seven children, and they appear to have lived here in this house for the rest of their lives, until their deaths in 1822 and 1838, respectively. On his gravestone, located across the river in Simsbury Cemetery, he is identified as “Capt Amaziah Humphrey.” He does not appear to have held this rank during the American Revolution, so it was probably a rank that he earned in the militia at some point after the war. This house was later inherited by Elijah Case, who was the son of Amaziah and Elizabeth’s daughter Caroline and her husband, Philander Case. Born in 1812, he became a shoemaker, and married his wife Paulina in 1849. The 1860 census shows them living here in this house with their two children, Henry and Flora, and at the time his real estate was valued at $1,200, plus an additional $1,000 for his personal estate. Two decades later, in the 1880 census, he was listed as a farmer rather than a shoemaker, and he died five years later, at the age of 71. In the absence of standardized street numbers in historical records, it is difficult to trace the exact ownership of this house. However, it appears to have remained in the Case family until at least the late 20th century. When the first photo was taken around the late 1930s as part of the WPA Architectural Survey, the owner was listed as the “L. Case Estate,” and as late as the 1990s the property was still owned by the Case family, who operated Case’s Flowers here. Today, the greenhouses, sheds, and other outbuildings that had been part of Case’s Flowers are now gone, but the house itself has hardly changed since the first photo was taken around 80 years ago. Along with the rest of the surrounding area, the house is now part of the East Weatogue Historic District, which was added to the National Register of Historic Places in 1990. 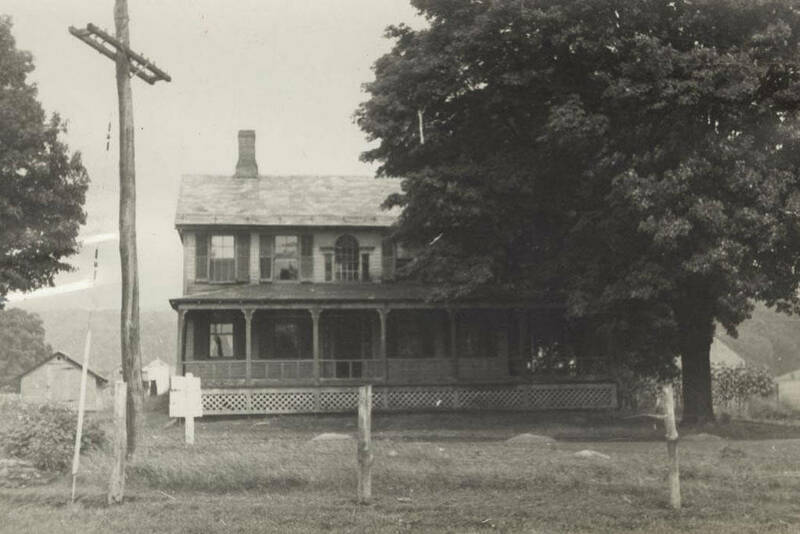 The house at 2 East Weatogue Street, at the corner of Hartford Road in Simsbury, around 1935-1942. Image courtesy of the Connecticut State Library. 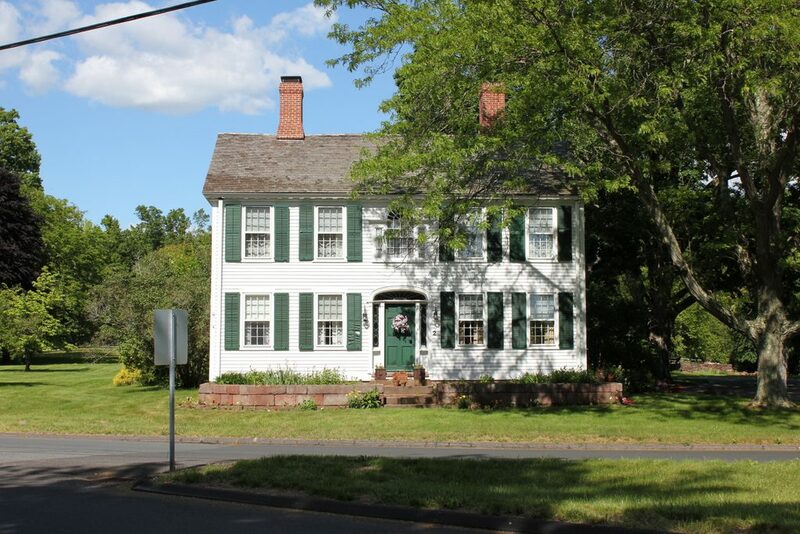 This elegant Federal-style home was built around 1800, and in the early 19th century it served as a tavern along the stagecoach route to Hartford. Located in the village of East Weatogue in Simsbury, it is in the narrow area of land between the Farmington River to the west and the Metacomet Ridge to the east, at the foot of one of the few passes through the long, narrow mountain ridge. It was an ideal spot for a tavern, because nearly all traffic between Hartford and Simsbury would have passed by the front door. Originally owned by David Phelps, the tavern is not to be confused with another Phelps Tavern, which was located in the center of town and was operated by Noah Phelps around the same time as this one. The architecture of the house reflects the Federal style of the era, with distinct features such as a symmetrical front facade, a Palladian window on the second floor, and a front door flanked with sidelights and a fanlight above it. The main section of the house has two chimneys, and when the first photo was taken the house had a total of 11 fireplaces. The wraparound porch, which extends the length of the front and the right side of the house in the first photo, was not original to the house, and was added around the turn of the 20th century. About 80 years after the first photo was taken, the house has seen some significant changes, most notably the removal of the large porch. Today, it looks much more historically accurate than it did in the early 20th century, and it still stands at an important intersection along the main route from Simsbury to Hartford. Despite its proximity to the state capital, though, the village of East Weatogue has retained much of its original agrarian appearance, and this house now forms part of the East Weatogue Historic District, which was added to the National Register of Historic Places in 1990. 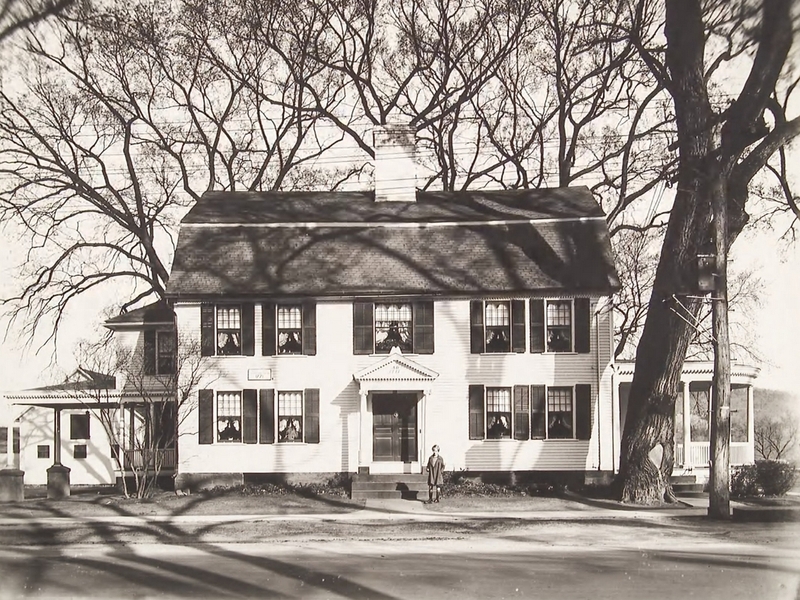 The house at 26 East Weatogue Street in Simsbury, around 1935-1942. Image courtesy of the Connecticut State Library, WPA Architectural Survey Collection. The town of Simsbury is situated along the banks of the Farmington River, with most of the town to the west of the river. On the east side, though, is the village of East Weatogue, which is located between the river to the west and the Metacomet Ridge to the east, near the corner of Hartford Road and East Weatogue Street. This area was first settled by Europeans in the 17th century, but it was destroyed by Indians in 1676 during King Philip’s War. It was subsequently rebuilt, though, and this house is one of the oldest existing homes in the village, dating back to around 1720. 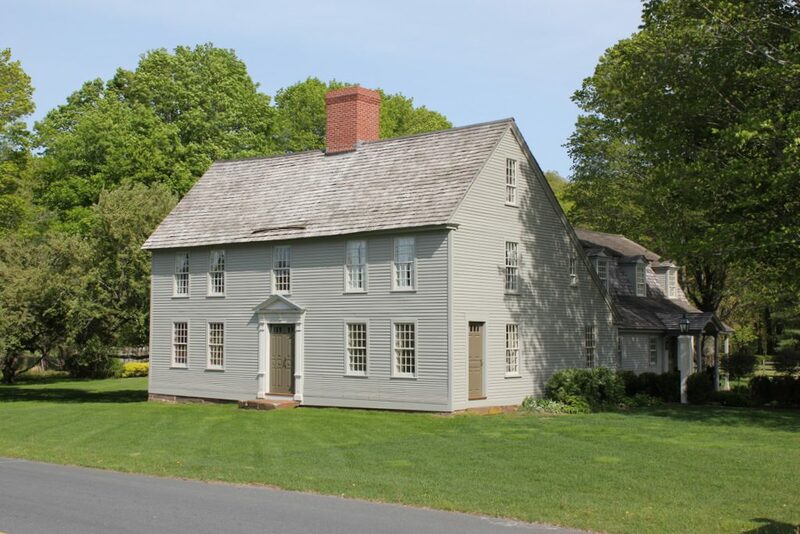 Like many other New England homes of the early 18th century, the house has a distinctive saltbox-style design, with two full stories in the front, one story in the back, and a large chimney in the center of the house. The original owner was Captain James Cornish, a farmer who was about 26 years old when he moved in here with his newlywed wife, Amy Butler. He and Amy had ten children, who were born between 1720 and 1740, and he became a prominent citizen in colonial Simsbury, earning the rank of captain in the town militia in 1736. After Amy’s death in 1763, James remarried to Hannah Hickox, who died in 1779. James himself lived long enough to see the end of the American Revolution, and he died in 1784, a few months shy of his 90th birthday. Over the years, East Weatogue remained a small farming village, and many of the colonial-era homes in the area have been preserved. The first photo was taken around the late 1930s or early 1940s, as part of a WPA architectural survey to document the historic homes in the state, and this was among several homes in the area that were included in the project. At the time, the exterior of the house had been somewhat altered by the addition of porches on the front and right side, but overall its saltbox-style architecture was still readily apparent, and the survey listed the house as being in “good” physical condition. In the nearly 80 years since the first photo was taken, the house has been expanded with a large addition on the back, and the front of the house has been restored to its original colonial-era appearance, without the porches. Although not visible in this scene, the property also includes James Cornish’s original 1720 barn, and both it and the house are now part of the East Weatogue Historic District, which was added to the National Register of Historic Places in 1990. Phelps Tavern on Hopmeadow Street in Simsbury, in 1926. Image courtesy of the Connecticut State Library. This house was built in 1771 for Elisha Phelps, a member of one of Simsbury’s most prominent 18th century families. He served in the American Revolution, participating in Ethan Allen’s capture of Fort Ticonderoga in 1775. The following month, he was appointed as a commissary and a captain in the Continental Army, a position he held until his death in 1776 while serving in Albany. His widow, Rosetta, moved out of the house in 1779 and sold it to Elisha’s brother, Noah Phelps. Like his brother, Noah had participated in the capture of Fort Ticonderoga, playing a particularly vital role. Prior to the capture, he had entered the fort disguised as a farmer in need of a shave. While there, he gained valuable intelligence about the vulnerability of the fort, particularly its weakened walls and wet gunpowder. This gave Ethan Allen the confidence to attack, and the fort was taken without a fight, leading to a significant colonial victory in the early days of the war. Noah Phelps only lived here for a few years before moving to a different house. He went on to serve in several different positions, including as a justice of the peace, a probate judge, a delegate to the state ratifying convention for the US Constitution, and a major general in the state militia. 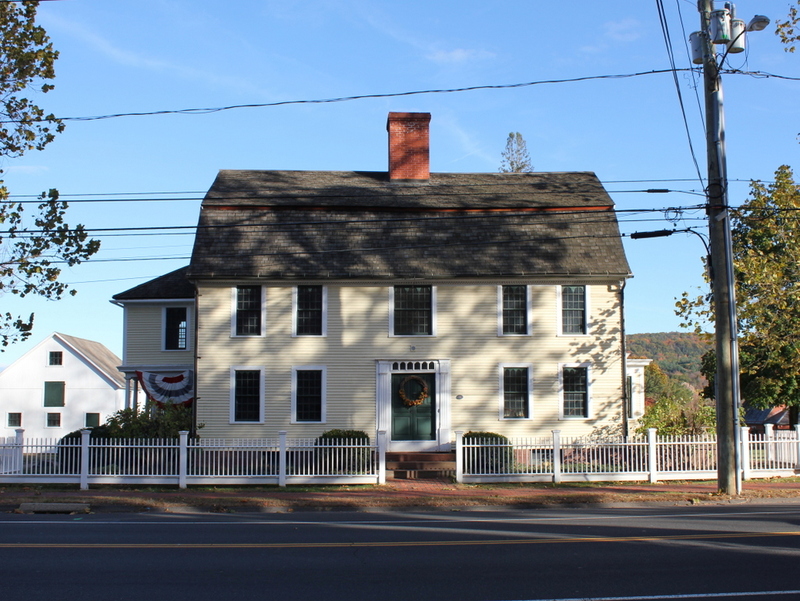 In the meantime, his son, Noah Amherst Phelps, moved into this house. During his ownership, the younger Noah used the house as a tavern. After his death in 1817, his widow Charlotte and later their son Jeffery continued operating the tavern. The tavern was in a good position to take advantage of traffic on the Farmington Canal, which was completed in 1835 and connected New Haven, Connecticut with Northampton, Massachusetts. It was built directly behind the tavern, only several hundred feet east of here, and the tavern became known as the Canal Hotel. However, the canal was never particularly successful, and its route was converted into a railroad in the late 1840s. Around this same time, in 1849, Jeffery Phelps closed the tavern, although the house would remain in his family for several more generations. 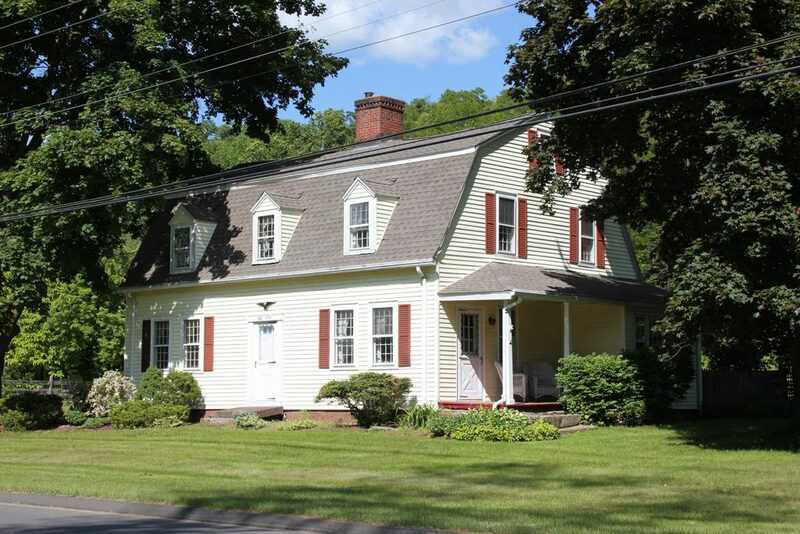 The house was modified in 1879 and again in 1915, but it was owned by members of the Phelps family until 1962, when it was donated to the Simsbury Historical Society. It has been preserved as a museum, and is listed on the National Register of Historic Places. The nearby Farmington Canal route is also listed, although the old railroad is long gone and the right-of-way is now a rail trail.